FREDERICKSBURG, VA -- Few would dispute -- there's a timeless quality to historical sites. Even fewer would contest the notion -- when you're at one, the past inspires the present. Sure, history is dimensional, very much part of our perceptive human world of time and space, but you can never quite escape from the reality that something important happened here. Such is the feeling you'll get at Lee's Hill Golfers' Club in Fredericksburg, Virginia (about an hour south of Washington DC). 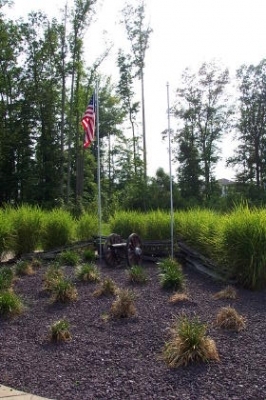 The course is placed in and around 19th century Confederate army campsites, occupied during the Fredericksburg Campaign of 1862-63. Several landmarks remain plainly visible 140 years later -- mainly earthworks dug out to protect the Southern army against invasion from the north. General Robert E. Lee selected this land for his headquarters, and many of the war's legends spent considerable time here. Looking back from the 18th green, you won't notice any earthworks, campsites or battle flags. But you will see a plethora of beautiful scenery. In other words -- yes, the men who occupied the place are long gone, and so are their tents, cooking utensils, rifles and campfires. But something tangible remains, long after their war's outcome was decided. At Lee's Hill, you can't help but come face to face with the past -- because it's all around you. Must be kind of spooky to walk through it on a cool, moonlit evening in the winter. It doesn't hurt that today there's a golf course on the property to distract from heavy notions of the struggle between life and death. No sliced drive or missed three footer could ever hurt as much as what the soldiers endured, so the folks at Lee's Hill give golfers the best of the past and present. 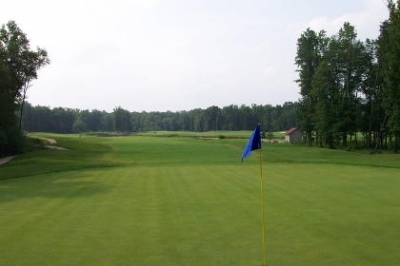 The layout is a Bill Love (of Ault, Clark and Associates) design that opened in October of 1993 -- the first of the 'new breed' of upscale golf courses now surrounding the Washington DC metro area. Leave it to historic ground to start a new trend. We all benefit from the property's current use as well as its weighty history lessons. Being a history buff, I gave the past a great deal of thought the day I played Lee's Hill, but the golf course didn't take a back seat to my intellectual ponderings. It's not tremendously long at 6834 yards from the tips and a par of 72, but here, power bows to intelligent play. Most of the holes are bordered by woods, water or wetlands (and, in fairness, a few houses) -- this isn't a layout where you can bang it into the next fairway and still make par. But at the same time, you can club down off the tee of many holes, so what the course takes away in breadth, it giveth back in lack of length. Plenty of green to 'shoot' at on the 6th hole. 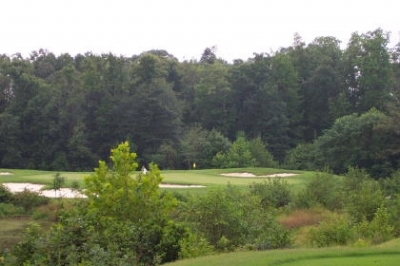 This very accessible hole location is ripe for a birdie try, too. I wouldn't exactly call it a target course, but placement and club selection rules the day at Lee's Hill in 2003. It's a different (and much safer) kind of target practice than in the 1860's -- and you won't even have to march in formation to receive your dismissal at chow time. Chad Maes, Lee's Hill's Head Golf Professional, says the course's strongest suit is the subtle changes it makes each time you give it a shot: "Any chance I get, my clubs are going out there -- because the holes are always a little different. Some little change of a tee from hole to hole or day to day -- you know, they move the tee markers just a slight bit in the tee box, or the pin placement on some of the greens, and it's a totally different hole." "It always keeps you guessing and thinking out there, so you never get bored with it," Maes adds. From the 18th fairway, glance across to the 10th green. The bulkhead over the pond looks quite impressive. Maes compares it to another place in his employment past, Augustine Golf Club, just 14 miles up I-95. "Both places have terrific layouts -- and always pose a challenge to me. They don't get easier from day to day, and that's perfect." Lee's Hill certainly does have a lot of Augustine's aesthetic qualities -- hence, a fair comparison. The only difference being some conditioning issues -- but Lee's Hill is less expensive than its more upscale neighbor to the north. Maes says some of the issues will be addressed in the future by irrigating the rough areas, making conditioning more uniform. Thick rough wasn't a problem on my day, however -- recent storms had made it quite omnipresent. The thought 'U.S Open' came to mind several times. Adding to the variety and difficulty are the contoured fairways. It seems that shorter courses make up for length in certain ways -- hazards, rough, or uneven lies -- or all three. Lee's Hill fits the description. Maes says a lot of the fairways slope towards the trouble, mandating even more precision from the tee to avoid getting into it. At the same time, as previously noted, you'll be able to club down from the tee box to give yourself that added accuracy. All around, it's a pretty balanced equation, just like the physical dimensions of space and time. If only Albert Einstein played golf, he might've discovered E=MC squared by playing at Lee's Hill. Okay, probably not. Short or long is death on the 195 yard, par three 14th hole. But there's more than enough room side-to-side. 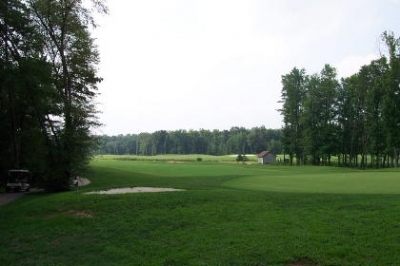 Start your journey through time on the first hole, a relatively tame 403 yard par four, dogleg right with a great deal of room on the tee ball and generous second shot possibilities. An easy hole to start the round off with. 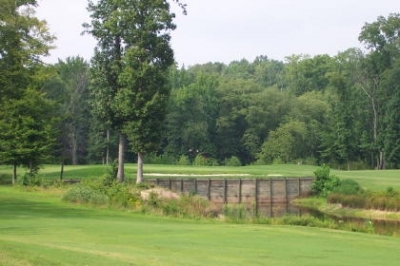 The second represents the greatest challenge on the course (#1 handicap hole), a brawny 579 yard three-shot par five that'll test your abilities on all three shots to give yourself a birdie try. Maes says the tee shot's the key -- if you want any chance to have a short iron third, you'll need to keep the ball in the short grass with the big dog. I found out he was right, though I did make a good par by one-putting after a solid fourth shot. The fourth is the toughest par four on the front, a 446 yard, dogleg right with a downhill, semi-blind tee shot. Despite the yardage, you may want to take less club off the tee, for accuracy's sake -- but then you'll need to take more into the elevated green. Tough hole. The rough can get quite thick at Lee's Hill. Take it from someone who was in it all day long. The fifth is Lee's Hill's signature hole, 150 yard par three that plays much tougher than the yardage indicates. There's trouble everywhere and the green's pretty small. Maes says, "If the pin's on the right-hand side, and the tee boxes are also over there, the green looks like the top of a pin. You're thinking 'I have an 8 or a 9 iron in my hands, and I'm nervous about hitting the ball.'" Nine's a potentially drivable 316 yarder, slight dogleg left with a narrowing fairway close to the green and sizeable bunkers in front. Fun to take a poke at, and you can still make birdie even if you're not in the short grass. Turning to the back, the tenth is a tough par five, 554 yards and doglegged left. The tee shot's the ultimate risk reward, as the more water you take on, the more leg you'll cut. The second shot's not easy either, as the fairway slopes down towards the water, and it's very visually intimidating. Nice hole concept. Twelve's the back nine's most demanding par four, 440 yards and a dogleg right -- with water all down the right side. If you choose to keep it left with your tee ball, you may end up in the rough or the trees, as the ball could roll through -- as I found out. Again, accuracy is key. Even the parking lot at Lee's Hill has reminders of the past. Lucky this one's not loaded. Fourteen's another aesthetically pleasing par three, 195 yards in length, with a full carry over wetlands and a green protected by four bunkers and large mounds. Wind direction and pin placement will weigh heavy on your club choice -- long as well as short is death. Eighteen is truly a classic finishing hole. 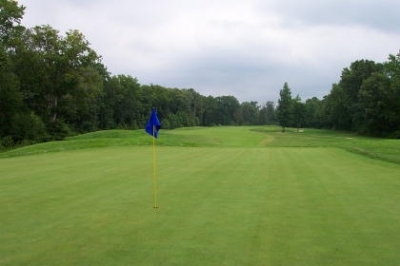 From the back tees, it's 605 yards, and it looks like you're hitting through a chute of trees to the narrow fairway. Avoid the left side, as even a good drive in that direction may roll into the lake that juts in just perfectly to catch an unsuspecting tee ball. There's lots of room to the right, however -- even more than appears from the tee. Great hole. I'll let Chad Maes sum up your day at Lee's Hill. "I want people, when they come here, to feel like they came out and played with three of their best friends, and that it's something they want to do every year, whether they play it a hundred times or just once. We may not have the biggest staff, or the most people out there working for us, but we'll definitely make your day enjoyable." I couldn't put it any better. And it all goes to show, when you're mixing in history, great golf and a winning layout, time and space are really just relative. Mon-Thurs: $36; Fridays: $42; weekends, $52. After 2 p.m, Mon-Fri, $33; $38 on weekends. All prices include cart fee.